This talk will present a practical overview of the newest survey data analysis capabilities in SAS/STAT 14.3. New enhancements in recent versions of SAS/STAT include bootstrap variance estimation for complex samples, fully efficient fractional imputation for survey data, design-weighted multilevel analysis via PROC GLIMMIX, and design-adjusted proportional hazards modeling. The talk will describe all available SURVEY procedures and their capabilities, present illustrations and examples, and end with a "wish list" of desired analysis tools that aren't yet available. Examples of working code will be provided throughout. 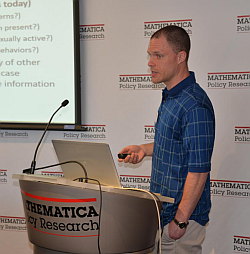 Brady T. West is a Research Associate Professor in the Survey Methodology Program, located within the Survey Research Center at the Institute for Social Research on the University of Michigan-Ann Arbor (U-M) campus. He is currently a member of the Technical Advisory Committee for the U.S. Bureau of Labor Statistics, the Director of the Junior Fellows Program of the Joint Program in Survey Methodology, and the outgoing chair of the Education Committee on the National Council of the American Association for Public Opinion Research (or AAPOR). He earned his PhD from the Michigan Program in Survey Methodology, located at the University of Michigan-Ann Arbor, in 2011. His current research interests include the implications of measurement error in auxiliary variables and survey paradata for survey estimation, survey nonresponse, interviewer variance, and multilevel regression models for clustered and longitudinal data. A first author or co-author of more than 120 peer-reviewed publications in survey methodology, statistics, and public health, he is the lead author of a book comparing different statistical software packages in terms of their mixed-effects modeling procedures (Linear Mixed Models: A Practical Guide using Statistical Software, Second Edition, Chapman Hall/CRC Press, 2014), and a co-author of a second book entitled Applied Survey Data Analysis (with Steven Heeringa and Pat Berglund), the second edition of which was published by Chapman Hall/CRC Press in June of 2017.